The classic autumn flavor of apple permeates the turkey inside and out — from the chopped apple, pecan and cornbread stuffing to the apple juice and jelly glaze. For Stuffing: Cook bacon in large skillet until crisp. Remove bacon and drain on paper towels. Reserve 2 tablespoons drippings in skillet. Set bacon aside. Add onion and celery to drippings. Cook on medium-high heat 15 to 20 minutes or until tender. Combine bacon, onion mixture, apples, pecans, thyme and sage. Stir in stuffing crumbs. Stir in broth and butter. Remove 7 cups of stuffing for stuffing turkey. Spoon remaining stuffing into 1 1/2-quart baking dish sprayed with cooking spray. Bake in a preheated 350°F (175°C) oven for 30 minutes; uncover and bake 15 minutes. For Turkey: Preheat oven to 325°F (160°C). Combine jelly, juice, vinegar, honey and salt in small, heavy saucepan. Bring to boil. Reduce heat and simmer until reduced to 1 1/4 cups, about 15 minutes, stirring occasionally. Reserve 1/4 cup mixture for gravy. Set remaining mixture aside for basting turkey. 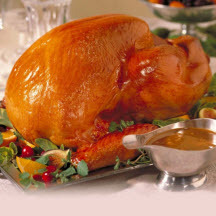 Uncover turkey breast and brush turkey with additional glaze mixture. Return foil to top of turkey and continue roasting until meat thermometer inserted deep in thigh reaches 180°F (82.2°C). Let turkey stand 15 minutes before removing stuffing and carving. For Gravy: Pour drippings into 1-quart measure; skim fat. Whisk in flour until smooth. Add reserved glaze mixture and enough water or broth to make 3 1/2 cups. Bring to boil; reduce heat. Simmer 3 to 5 minutes or until thickened, stirring occasionally.